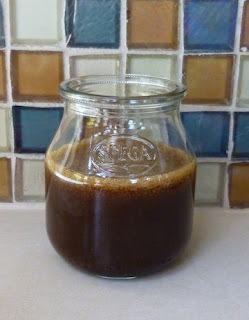 Karina's Garlic Vinaigrette Salad Dressing - Kid Friendly, Gluten Free And Delicious! My daughter-in-law, Karina, cutting lettuce for our salad. 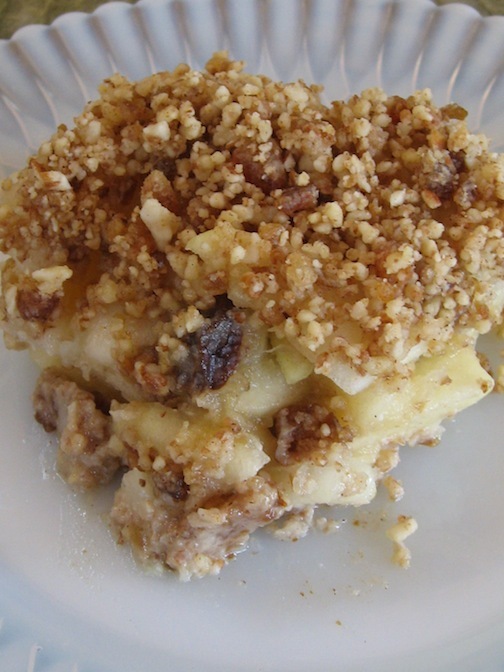 Thanks Karina for sharing your wonderful recipe with me and the Foods For Long Life followers! My kids and grandkids were here for the past week for our annual get together. Most parents feel overwhelmed when there are that many mouths to feed but luckily, all my kids are amazing cooks! During the week I not only got to cook them my favorite recipes but they cooked some wonderful dishes for me too! So this week, I'll be featuring their recipes. Infused with crushed garlic, this dressing uses 2 types of vinegar. 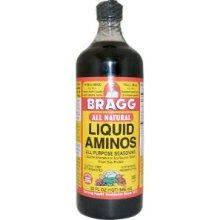 My grandchildren adore soy sauce, but in this dressing they all prefer the taste of Bragg liquid aminos which is similar to soy sauce. Although it's gluten free, it does have more sodium than Ohsawa Nama Shoyu raw soy sauce (960 mg vs. 720 mg per tablespoon). * For vegans who avoid honey, substitute your favorite sweetener (agave, raw sugar, etc.). It's important to really smash the garlic (I use the side of a big knife and my fist) and then finely mince it. This will allow its flavor to infuse into the dressing. Combine all ingredients in a small jar with a lid. Tighten the lid and shake vigorously for one entire minute. Let sit for at least an hour. In fact, the longer it sits, the better. It will last in the refrigerator for up to 2 weeks. Toss desired amount with salad greens and serve. Per tablespoon: 64.8 calories, 7.0 g fat, 1.0 g saturated fat, 0 mg cholesterol, 0.1 g protein, 1.3 g carbohydrates and 0 g dietary fiber. Healthy Vegan can also mean Tasty! The very sound of "healthy vegan" would make most people run the other way, but the same team that brought us yummy raw food at Cafe Gratitude, now offers a selection of very delicious vegan Mexican cuisine at their restaurant, Gracias Madre. The two words I would use to describe their food are "Flavorful" and "Hearty". Most of the dishes we tried had a spicy and intensely flavorful sauce that really made the dish. "Hearty" also means filling so be careful not to order too much. Make sure you leave some room for their beautiful desserts! We started the meal by sharing an order of guacamole. It tasted a lot like ours with cilantro, lime and onion, and was served with 4 warm handmade tortillas. My absolute favorite thing on the menu was undoubtedly the quesadilla! A tortilla was filled with sweet potato and caramelized onions and covered with a wonderful nacho cheese sauce and pumpkin seed salsa. Nice spice to it and just delicious! Unfortunately I ate the entire dish before I decided to review the restaurant so I didn't get a picture of it. But take my word for it, it was amazing! This homemade pastry shell was filled with poblano chiles, onions and mushrooms, served on mole and topped with cashew cream. It had a nice consistency and the mole had just the right heat. Although the ingredients for this dish were wonderful (mushrooms, a spicy and flavorful mole sauce, etc. ), the manner in which they served it was not. All the ingredients were pilled up on top of several thick tortillas which made it very difficult to eat. I would have preferred that they rolled them up the way enchiladas are usually served. Actually, by the time I got to this dish, I was a little tired of eating tortillas. Next time I will ask them to put the mushrooms and delicious mole sauce on top of brown rice. I think that would be great! This dish came with greens and black beans. My husband and nephew had nopales, a dish that featured cactus. I believe this is a seasonal dish. They both said "it was very enjoyable but not memorable". My daughter ordered this dish. It was a big, generous pile of roasted potatoes topped with a cashew nacho cheese. Although I thought this dish was quite good (the potatoes were perfectly roasted in garlic and oil and the cashew cheese had a lovely, spicy flavor), it was a better dish to share than to have as a main course. How many potatoes can you eat? We also order a side of greens which were the same as what was served with the enchiladas. They were perfectly cooked and the crunch of the pumpkin seeds added a delightful dimension. But the best side was a baked cauliflower dish that had a crispy topping. Unfortunately the picture I took of that dish came out a bit fuzzy but I think that was one of the best dishes we ordered! All in all, I loved the restaurant and will definitely return to Gracias Madre! Next time I'll come for dinner instead of lunch and try one of their margaritas and definitely leave some room for dessert! If you're in San Francisco, you should definitely give it a try! This morning I read an article by Chris Bjorklund, a well known consumer advocate, that named some foods that could be deadly for dogs. I was quite surprised by several of them, so I wanted to blog this right away to warn my dog-loving followers. Her information is from Dr. Kristina Hansson who is a veterinarian at Northbay Animal Hospital. I also added some conditions and symptoms from other web-related research. * Chocolate (especially ones with high cocoa content) - Treobromine in chocolate is toxic to dogs and could lead to elevated heart rate, seizures or death. * Macadamia nuts - can cause a toxic reaction called macadamia nut toxicosis. Symptoms include walking wobbly or inability to stand, muscle tremors and weakness, swollen limbs and joint pain. * Rising bread dough - the yeast can continue to expand in your dog's stomach which could be fatal. * Onions and Garlic - can cause haemolytic anaemia which can cause your dog's blood cells to burst. * Fatty turkey and chicken skins - Eating these can give your dog gastro-intestinal distress or pancreatitis. * Grapes and raisins - a big warning to my fellow wine grape growers as most have doggies who love to munch the grapes right off the vines!! Eating these can cause your dog to have kidney failure which can be fatal. Feeding table scraps to dogs is never a good idea but please be aware that it can have severe and sometimes fatal consequences! Dates and cashews provide the creamy base for the pecan and coconut icing. I know it's a big jump from the raw vegan, gluten free cleanse we did last week to a German chocolate cake, but I'm getting ready for our annual family party. Every year we all get together to celebrate Summer Solstice. It's not that we are into pagan rituals, the family just decided that the end of June was a perfect time to get together. The airports aren't too crowded. There's no chance of snow delays. Our pool is generally warm enough by then for the grandkids to swim. And the date has generally worked out for everyone! So with this year's party coming up, I thought I'd better decide on a yummy dessert that will please the crowd. The number one concern for me is NO DAIRY. Last year's party coincided with our 20th wedding anniversary and I bought a decadent cake from this very fancy bakery in Sebastopol. Although everyone really enjoyed it, (I must admit, it was delicious), I felt awful after eating it. It must have contained lots of cream and I'm lactose intolerant. So this year, I'm going to make the dessert myself! German chocolate cakes have an icing that always includes two ingredients that are pretty high in calories and high in fat - coconut and pecans. Although neither of these ingredients are particularly unhealthy foods, when you combine them with white sugar, evaporated milk, butter and egg yokes (as in the traditional recipe), you can end up with a piece of cake that exceeds 600 calories per slice! So even though my recipe is fairly high in calories, it is made mostly from whole, natural foods and is still half the calories of some traditional recipes. The saturated fat comes from coconut's tropical oil which is not harmful like the saturated fat from butter. And, the cake is cholesterol free and rich in heart healthy nuts! So although you shouldn't make this rich cake a regular part of your diet, it's a wonderful treat when the family gets together. I hope my family likes it! Vegan chocolate chips are folded into the cake batter for added richness . This vegan chocolate chip cake is delicious even without icing and it's only 161 calories per slice! Dust with powdered sugar and serve with sliced strawberries! Cut wax paper to fit the bottom of an 8 inch cake pan and place in the bottom. Grease the sides of the pan with vegan margarine or olive oil. Set aside. To make the cake, begin by making a flax egg by combining ground flaxseeds and water in a small bowl or cup. Beat with a small fork until the mixture becomes gooey. Set aside. Combine flour, cocoa powder, baking soda, baking powder and salt in a large bowl and mix well. In a medium bowl, mix the sugar with soy milk, mashed banana, vanilla, olive oil and flax egg with an electric beater (if you have one) until thoroughly combined. Add this to the dry ingredients and beat again until well blended. Fold in the chocolate chips and pour into prepared cake pan. Bake for 22 to 25 minutes or until you can insert a toothpick in the middle and it comes out clean. Remove from oven and cool in the pan, on a rack, for 5 to 10 minutes. Turn the cake onto the rack, gently removing the wax paper from the bottom. Turn the cake back over so it is cooling with its top facing up. Set aside until it's completely cool. To make the icing, add soaked and rinsed cashews, the dates and 1/4 cup of their soak water, vanilla and maple syrup to a food processor with an S blade. Process until smooth and creamy scraping down the sides when necessary. Add all but 1 tablespoon of the shredded coconut and pulse a few times until it is combined. Place into a bowl and stir in the chopped pecans. Ice the cake and sprinkle the remaining tablespoon of coconut over the top. Per serving (12 pieces): 333.7 calories, 19.7 g fat, 6.6 g saturated fat, 0 mg cholesterol, 5.8 g protein, 37.6 g carbohydrates and 5.4 g dietary fiber. Per serving (16 pieces): 250.3 calories, 14.7 g fat, 4.9 g saturated fat, 0 mg cholesterol, 4.3 g protein, 28.2 g carbohydrates and 4.1 g dietary fiber. ONE WEEK RAW AND GLUTEN FREE - Day 7, Learn To Make Raw Meatballs On Zucchini Ribbon Pasta! DAY 7 OF "ONE WEEK RAW AND GLUTEN FREE"
Today is the 7th and last day of our "One Week Raw and Gluten Free" mini cleanse. But it doesn't have to be the end. If you want to extend it a few more weeks, just repeat the recipes you enjoyed during the week. In case you missed any of them, check out DAY 1, DAY 2, DAY 3, DAY 4, DAY 5 and DAY 6. Strawberry, pear and spinach "green smoothie"
Place all ingredients in a VitaMix blender and process until smooth. Per serving: 190.8 calories, 7.0 g fat, 0.5 g saturated fat, 3.7 g omega 3 and 1.0 g omega 6 fatty acid, 0 mg cholesterol, 2.3 g protein, 35 g carbohydrates and 8.3 g dietary fiber. 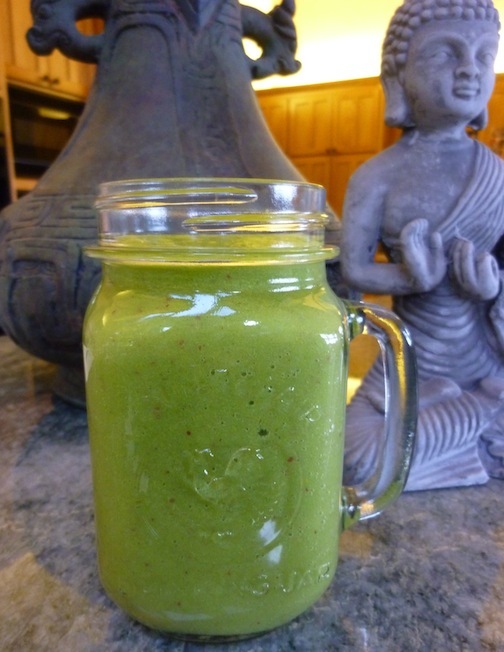 This green smoothie is high in fiber and omega 3 fatty acid. Spinach contains lutein and zeaxanthin which may decrease the risk of age related macular degeneration. * When I clean organic strawberries, I cut off the tops (which include a 1/2 inch of strawberry), freeze them and use them for smoothies. Today's snack is leftover pear and apple crisp. That is, if you didn't eat it all last night! It's sooo good!! For the dressing, I had leftover ginger tahini dipping sauce from DAY 6 which I thinned with some freshly squeezed lime juice and a little water. If you ran out, make a little more! So fill your refrigerator with veggies and experiment with combinations for lunch or dinner each day! Today's lunch is a MONSTER salad with many of the leftover veggies from this week's menus. Today we're going to make little raw meatballs. My poor Italian grandparents, were they alive, would think I was absolutely nuts! But these little guys, made from walnuts and other goodies, really taste meaty! We're also going to make a raw tomato sauce for our zucchini pasta. When not on a raw cleanse, you can serve this delicious and healthy raw sauce mixed with hot pasta and the raw meatballs (at room temp) on top. They are too delicate to mix in or cook. I've posted this on the blog before (in fact it is one of the most "googled" recipes) but it's improved and changed a bit to make it gluten free. Make the zucchini ribbons by peeling the zucchini with a potato peeler, gradually rotating with each peel. To make a thinner spaghetti, use a vegetable slicer. My favorite is Benriner. Wrap the ribbons or spaghetti in a paper towel until ready to use otherwise they will get watery when combined with the sauce. Making the zucchini ribbons with a vegetable peeler. 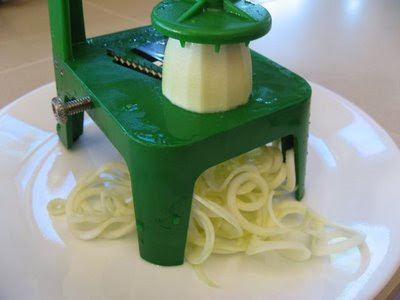 You can make zucchini spaghetti by using a Benriner spiral vegetable slicer. Peel the zucchini first so it really looks like spaghetti! To make the sauce, drop a clove of garlic in the chute of a food processor with an S blade while it's running. After it is minced, add the drained sun dried tomatoes and date along with the fresh tomatoes, olives, and the rest of the tomato sauce ingredients. Process until smooth, place in a small bowl and set aside. Top with extra parsley and freshly ground black pepper and serve! Wash and dry the food processor. To make the meatballs, drop a clove of garlic in the chute of the food processor while it's running. After it is minced, add the walnuts, nutritional yeast, olive oil, lemon juice and Bragg liquid aminos and process until smooth, scraping down the sides when necessary. Place in a bowl and mix in green onion and parsley. Form 12 small balls from the mixture, dip each one in tomato sauce to coat and set aside. Mix the zucchini pasta in the desired amount of sauce. Serve onto 4 plates and top each with 3 sauce covered meatballs. Garnish with parsley and freshly ground black pepper and serve immediately. ONE WEEK RAW AND GLUTEN FREE - Day 6, Veggie Sushi With Ginger Tahini Dipping Sauce! DAY 6 OF "ONE WEEK RAW AND GLUTEN FREE"
Have you been following along this week with our "One Week Raw and Gluten Free" mini cleanse? If not, check out DAY 1, DAY 2, DAY 3, DAY 4 and DAY 5. Lunch: Tomato caprese salad (with the leftover cashew ricotta from last night's pizzas). Add all ingredients to a VitaMix or high speed blender and process until smooth. If you'd like, enjoy both servings throughout the morning. Per serving: 208.3 calories, 7.5 g fat, 0.5 g saturated fat, 3.8 g omega 3 and 1.1 g omega 6 fatty acid, 0 mg cholesterol, 2.3 g protein, 37.8 g carbohydrates and 6.8 g dietary fiber. Frozen blueberries turn "green smoothies" purple which makes it much easier to get the kids to drink them! Slice the top and bottom off of each tomato and cut the remaining center into 3 thick slices. 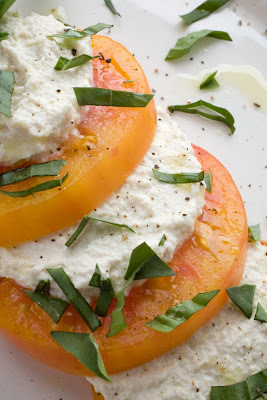 Build the Caprese salad on two small salad plates starting with 1 slice of tomato, a heaping tablespoon of cheese spread in a circle over the tomato slice, another tomato slice, another layer of cheese and a third tomato slice and a final layer of cheese. Sprinkle a tablespoon of chopped basil over each salad. Top with freshly ground black pepper, salt and extra virgin olive oil. Per serving: 199 calories, 17 g fat, 3 g saturated fat, 0 cholesterol, 5.3 g protein, 9.3 g carbohydrates and 1.3 g fiber. Cashew ricotta takes the place of mozzarella in this raw, vegan Caprese salad. This recipe combines two old favorites. The first is a Raw veggie wrap with ginger tahini dipping sauce. I borrowed many of the veggie ingredients and I used most of the dipping sauce recipe substituting Braggs liquid aminos for Nama Shoyu soy sauce. This was necessary to make the recipe gluten free since soy sauce is usually not. If gluten is not an issue for you, you can use soy sauce. The other recipe I borrowed from is Veggie sushi rolls. Sushi rolls are easy to make once you get the hang of it! To make the sauce, combine all sauce ingredients in a small bowl. Set aside. To make the sushi, place a sheet of Nori on a bamboo sushi mat. Arrange strips of veggies and fruit starting one inch from the bottom of the Nori. Using the sushi mat, roll from the bottom up. After the bottom edge is over the filling, squeeze it gently with the mat and then roll to the top. Wet the top of the Nori and complete the roll. The moisture will seal it. Get a little bamboo mat to roll your sushi. Try using other fruits (like apple and pear) or veggies (like red bell pepper and zucchini) and your favorite sprouts! The combinations are unlimited! To make the crisp, place almonds in a food processor with an S blade and process until coarse. Add walnuts, dates, cinnamon and salt and process until the mixture begins to stick together. Remove mixture and set aside. Don't wash the food processor, you'll be using it again. 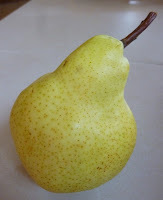 To make the filling, place the pears and apples in a large bowl and toss with the Fruit-Fresh produce protector. Remove one cup of this filling and place in the food processor. Drain the soaked dates but don't squeeze out the moisture. Add them and the nutmeg to the food processor and process until smooth, scraping down the sides when necessary. Stir mixture into the bowl of sliced fruit along with the raisins. Spread 1/3 of the crisp on the bottom of an 8" x 8" pan. Place all of the filing on top of it. Sprinkle the remaining crisp over the filling. Serve immediately or refrigerate. It will keep for several days. Per serving: 246 calories, 11.6 g fat, 1.0 g saturated fat, 0 g cholesterol, 4.1 g protein, 27.5 g carbohydrates and 5.6 g of fiber. You'll be enjoying this again for tomorrow's snack. Share it with friends - they won't believe it's raw! Raw garden pizza with cashew ricotta on sprouted lentil crust! DAY 5 OF "ONE WEEK RAW AND GLUTEN FREE"
Have you been following along this week with our "One Week Raw and Gluten Free" mini cleanse? If not, check out DAY 1, DAY 2, Day 3 and DAY 4. Tonight we're having raw pizza on the sprouted lentil pizza crusts we made yesterday. So soak one cup of raw cashews in a bowl of filtered water early in the day. Later we'll make cashew ricotta from the soaked nuts. Chia pudding isn't just for dessert! It's a wonderful, healthy pudding that can be eaten any time of the day for any meal or snack. I love eating it for breakfast mixed with a bowl of fresh fruit. Today I enjoyed some chia pudding with a diced fresh mango and organic raspberries. Yummmm! To make chia pudding, see DAY 2. Chia pudding and fresh fruit make a wonderful breakfast! Top with chopped raw English walnuts for extra nutrition. Today's snack is an organic Fuji Apple. Apples are very helpful in regulating blood sugar. I throw apple slices in a baggie and carry them in my purse when I go shopping just in case I get hungry! Put the dried coconut in water and let rehydrate for 20 minutes. After 20 minutes, put coconut and water in a high speed blender with sprouted lentils (saving some for the garnish), onion, zucchini, half the red bell pepper, garlic, curry powder, banana, jalapeno, lime juice, avocado, salt and cayenne pepper. Blend until smooth and place in two bowls. Top with extra sprouted lentils, chopped red bell pepper, corn kernels and cilantro and serve. Per serving: 327 calories, 14.6 g fat, 4.5 g saturated fat, 2.3 g cholesterol, 8.8 g protein, 47 g carbohydrates and 9.7 g dietary fiber. This rich and spicy soup is one of my lunch favorites! To make cashew ricotta, place cashews, lemon juice, salt and most of the water into the VitaMix or other high speed blender. Starting at a very slow speed, and increasing slowly, blend until the mixture reaches the texture of ricotta cheese, scraping down sides and the rest of the water only if needed. Spread ricotta on pizza crust and top with desired toppings. Cashews blending in a VitaMix blender. Top the garden salad pizza with all of your favorite salad ingredients! Dessert is a bowl of mixed, fresh, organic berries. I love raspberries, blueberries and blackberries! Ingredients for your Green Smoothie! DAY 4 OF "ONE WEEK RAW AND GLUTEN FREE"
Have you been following along this week with our "One Week Raw and Gluten Free" mini cleanse? If not, check out DAY 1, DAY 2 and DAY 3. Let's Make Pizza Crust and Crackers! Our green lentil sprouts should be ready by now. Soak, rinse and dry them. We'll be making pizza crust, some crackers and later on, a raw soup. Measure out 1 packed cup of sprouts and wrap the remaining sprouts in paper towels or a cotton dish towel and refrigerate them. In a large bowl, combine flax seeds and Italian seasoning with filtered water. Soak for 4 to 6 hours. The flax seeds will absorb all of the water. In a separate bowl, while the flax seeds are soaking, soak the walnuts in filtered water for 4 to 6 hours. After soaking, rinse walnuts well and place in a food processor with an S blade with the sprouted lentils, carrot, celery, Bragg liquid aminos and lemon juice. Blend until smooth but don’t over process. Add this mixture to the large bowl with the soaked flax seeds and mix well. Drop ¼ cup of the mixture onto a Teflex dehydrator sheet and form eight 4” x 2 ½” rectangle crusts. You can also make them wedge shaped or round. Don’t make them too thin as they will naturally thin out as they dry. If you have extra, make some smaller crackers to enjoy. Dehydrate at 105 degrees F. for 8 hours. Flip over, remove the Teflex sheet and dry directly on the dehydrator screen until crisp (6 to 8 more hours). Set aside finished pizza crusts and crackers as we will be using them later in our "One Week Raw" menus. With the extra mixture, make some smaller crackers. They are perfect to eat with soups and raw dips! 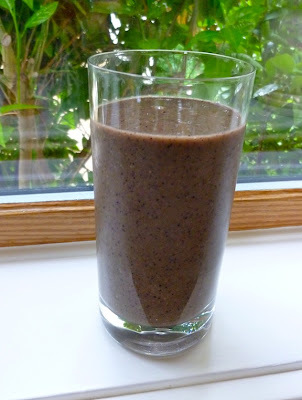 Place Brazil nuts and water in a VitaMix blender and process until it looks like milk. Add the rest of the ingredients and process until smooth. Drink one serving and sip the other throughout the morning. Per serving: 207 calories, 6.0 g fat, 2.0 g saturated fat, 0 mg cholesterol, 4.0 g protein, 34.5 g carbohydrates and 7.0 g dietary fiber. Pears make the perfect smoothie fruit. They are high in fiber and make your smoothie thick and creamy! Each serving provides 7 grams of fiber and 274% of the RDA of selenium - a potent antioxidant critical for proper thyroid functioning. Brazil nuts are the best source of this mineral. Green smoothies are extremely popular in the raw food community. Many people do a cleanse by just drinking green juices and smoothies all day. I find juice fasts hard to sustain, especially if you have low blood sugar like I do. 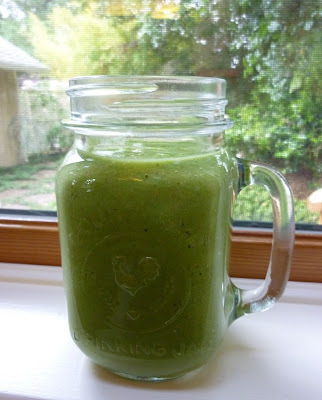 But when my garden if full of greens, I start almost every day with a green smoothie. Besides kale, I use spinach and chard for my greens and I also use apples, bananas, blueberries and figs for my fruit. I often add a tablespoon of unrefined flaxseed oil to the blender to get additional omega 3 fatty acid. Vitamineral Green is also a good "green" addition to your morning smoothie! Today's snack is half a grapefruit. If you have some, garnish with some berries! If you're still hungry, eat another! To sweeten the grapefruit, I use stevia. Tonight's dinner is not a specific recipe. 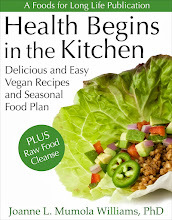 It's a HUGE bowl of your favorite greens (red leaf lettuce, spinach, etc. ), heirloom tomatoes, shredded carrot, avocado, cucumber, radishes, bell peppers and whatever else you want to toss into a salad bowl. Let your imagination go wild! Throw in a teaspoon of raw sesame seeds and/or pumpkin seeds and dress it in a quick balsamic vinaigrette. Serve the salad with raw corn on the cob. Yes, you heard me, raw corn on the cob. No cooking, no butter, no nothing! I thought it was weird when I first tried it but now, it's the ONLY way I eat corn. It's hard to improve the flavor of a piece of fresh, crisp, sweet corn on the cob! If you must, rub it with a piece of fresh lime and dust with a touch of salt and freshly ground black pepper. Mix all ingredients. Pour required amount over salad. Let's eat a HUGE green salad tonight with veggies and seeds! Whether you are a vegetarian, vegan, meat or fish eater, you should try to eat a salad like this every day of your life! Note the beautiful ears of unadulterated raw corn in the background! Tonight's Dessert is a bowl of watermelon balls topped with dried, unsweetened, shredded coconut.